An HK$11.7 billion plan to phase out old diesel vehicles is one of a host of policies an environmental group said had only “minimal impact” on lowering roadside pollution to safer levels in Hong Kong. And the effectiveness of those policies may have now reached a plateau, said the Clean Air Network. 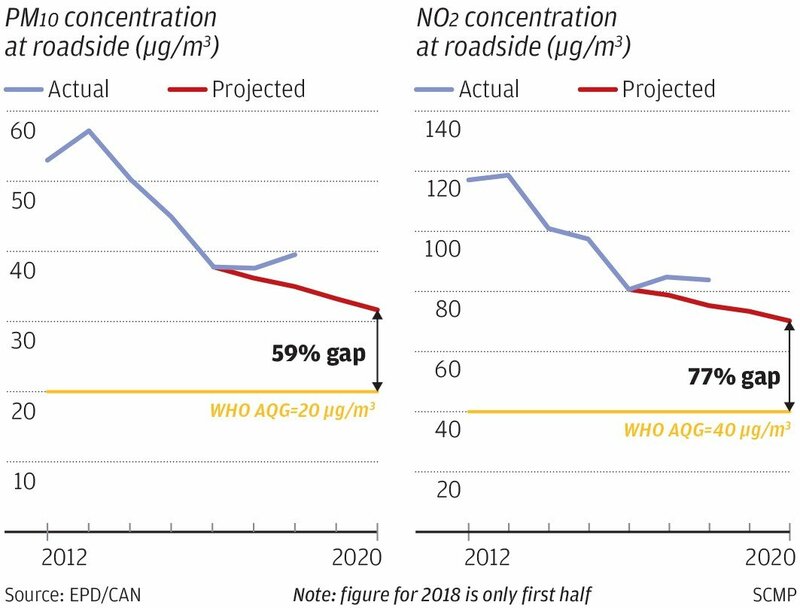 Results from a new half-year study by the group found concentrations of two key roadside pollutants deviated from projected declines in the Environment Bureau’s 2016 progress report for its 2013 air quality blueprint. “It proves that there has been some inadequacy … with existing policies, rendering [the government] unable to lower it to their projected level,” the group’s community relations manager, Loong Tsz-wai, said. Among those emissions control policies were a HK$11.7 billion plan to phase out old diesel commercial vehicles by 2019 and a green transport fund. “Existing emission control measures have been inadequate in lowering air pollution to safer levels for public health. To achieve this, we need new commitments from the incumbent government to clean the air,” Loong said. Annual average roadside concentrations of PM10 – specks of tiny respirable particulates that can get deep into the lungs – dropped from about 53 micrograms per cubic metre of air in 2012 to less than 38mcg in 2017. But from January to June, average concentrations measured at roadsides rose to 40mcg, despite the progress report projecting a drop this year to 35mcg. Nitrogen dioxide (NO2) fell from 118mcg in 2012 to 82mcg in 2016, but may miss its projected mark of dipping below 80mcg by this year. The figure rose to 85mcg in 2017, and 83mcg up to June. The bureau’s Clean Air Plan, launched in 2013, expected PM10 to drop to 32mcg by 2020, the third of three interim targets for the pollutant set by the World Health Organisation, but still 59 per cent above its ultimate safe guideline of 20mcg. NO2 was projected to drop 40 per cent to 70mcg by 2020, albeit still 77 per cent above the WHO’s ultimate guideline of 40mcg. The group urged the government to pursue more targeted policies focusing on traffic congestion, such as limiting vehicle growth and electrifying more public transport. In 2017, electric vehicles only comprised 0.7 per cent of the private car fleet, and 0.04 per cent of the commercial fleet. The group said electrifying all franchised buses plying the city’s three low emissions zones – Central, Mong Kok and Causeway Bay, home to about 250 routes – could cut 646 tonnes of NO2 emissions, roughly equivalent to the emissions of all private cars in a year. The government was also urged to tighten its own air quality objectives to meet the WHO’s ultimate guidelines. A review of these objectives is expected to be completed this year, followed by a public consultation. The Environmental Protection Department said major pollutants – including PM10 and NO2 – had been in general decline since 2013, suggesting “emission reduction measures introduced in recent years have paid off”. Short-term air quality is also affected by the weather. “With the retirement of more … diesel commercial vehicles … roadside NO2 pollution will continue to improve,” a spokesman said. Meanwhile, the environmental group’s half-yearly review found air pollution to be largely concentrated in western districts such as Central and Western, Kwai Tsing, Sham Shui Po, Tuen Mun and Tsuen Wan. Ambient average concentrations of NO2 in all five districts breached the WHO’s annual safety limit. Ozone pollution, a secondary pollutant formed by several sources, also reached another new high in the first half of the year. It was found to have risen in tandem with NO2 on high-pollution days.